Lake Geneva has a phenomenal sculpture of influential reformers. Above the picture read the words Post Tenebras Lux – After Darkness, Light. On October 31st, 1517 an Augustinian monk by the name of Martin Luther nailed 95 theses to the door of the Wittenberg Cathedral. 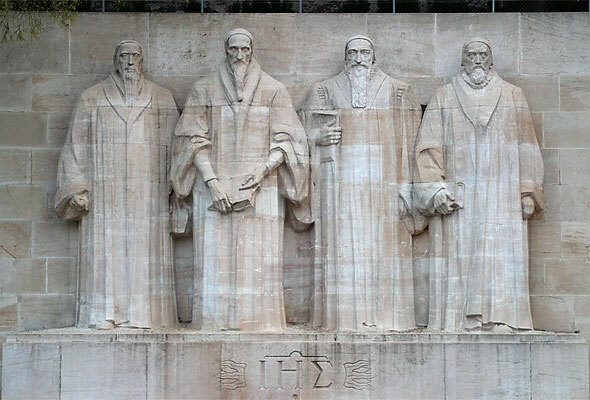 This marked the beginning of the Protestant Reformation. Germany and many other countries of the world celebrate October 31st as Reformation Day. After the darkness of ignorance, God brought the light of his love. This day marked a watershed in the history of the world. We went from superstition and insecurity to the beauty of faith and assurance. Every inch of Creation is alight with the fire of God. God in creating us bestows every single one of us with common grace. Jesus succinctly said God “makes his sun rise on the evil and on the good, and sends rain on the just and on the unjust.” Yet it was his invincible and effective grace that set us free from works, from performance, and from an inherent need to prove ourselves. His freely offered grace brings light into the darkness of our ignorance and lets us know that we are loved. We opted for darkness and fell from Grace. But God, in his infinite mercy and wisdom, brought light into our darkness. He ended our personal dark age and ushered in the light of his Son. We are no longer slaves of performance, but sons and daughters who have been justified and adopted freely into God’s family. Martin Luther helped us rediscover the light of God’s love on the cross and the assurance of our vindication.